The indices (DJIA 23348, S&P 2572) retreated from Friday’s strong performance. Volume was down, but still high; breadth was weak but remains at a positive level. Both remain above their 100 and 200 day moving averages and are in uptrends across all time frames. 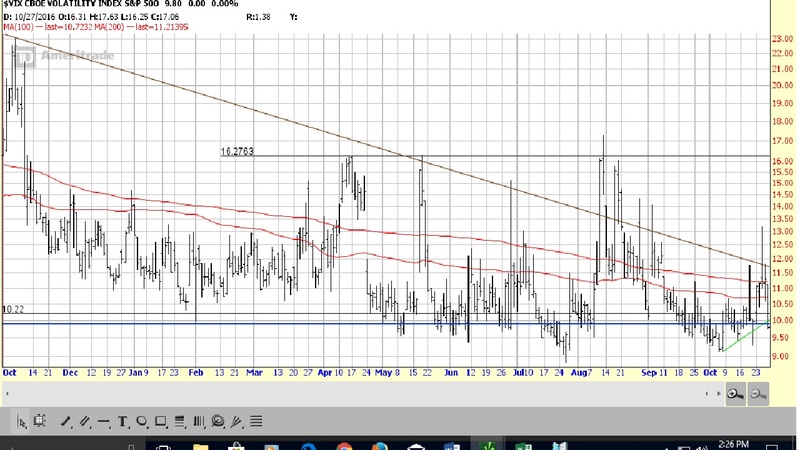 The VIX (10.4) was up 7%---finishing below the upper boundary of its short term downtrend, below 100 day moving average (now resistance) voiding its recent break, back below its 200 day moving average (now resistance) voiding its recent break, above the lower boundary of its long term trading range and continues to develop a very short term uptrend. It still looks like the July low was the bottom. The long Treasury jumped 1%, ending below (but near) its 100 day moving average (now resistance) and continues to develop a very short term downtrend, but back above its 200 day moving average (now support) voiding its recent break, above the lower boundaries of its short term trading range and long term uptrend. The dollar dropped, ending within in its short term downtrend and below 200 day moving average (now resistance) and but above its 100 day moving average for the third day (reverting to support) and continues to develop a very short term uptrend. GLD rose, finishing below its 100 day moving average but just barely (so I am now delaying its reversion from support to resistance for another day), still above its 200 day moving average (support) and the lower boundary of a short term uptrend. Bottom line: long term, the indices remain strong viz a viz their moving averages and uptrends across all timeframes. Short term, they are above the resistance level marked by their August highs, meaning that there is no resistance between current price levels and the upper boundaries of the Averages long term uptrends. Despite some recent churn, the technical assumption has to be that stocks are going higher. Trading in UUP, GLD and TLT were again out of sync with themselves and the stock market. I remain uncomfortable with the overall technical picture. Two economic stats were reported yesterday and were mildly upbeat. September personal income and the PCE price index were in line, while personal spending and the October Dallas Fed manufacturing index were above estimate. ***overnight, October EU inflation declined from 1.5% to 1.4%; this following the reports on third quarter EU GDP growth that came in above estimates. These are goldilocks numbers; so why is Draghi fighting reducing QE? You would think that he would want to unwind QE so he that has policy ammunition for the next economic downturn. In addition, October Chinese manufacturing and services PMI’s were both below expectations; and the BOJ left rates and QE unchanged as the October inflation rate declined. (1) the tax reform bill is supposed to be unveiled on Wednesday. The latest rumors on what it will or will not contain are [a] deductions of state and local taxes have been left in and [b] the corporate tax cut will be phased in. (2) Trump is set to announce his choice for Fed chairman when Yellen’s term ends. At the moment, Powell is the odds on favorite---he being the most dovish and hence the most likely to keep QE around as long as possible. That in turn would likely be a plus for stocks; and with the Donald continuously commenting on how well the stock market has done since his election, it is no surprise that Powell would be the leading contender. (3) the FOMC meets. At the moment, the Market seems confident that policy will remain unchanged, i.e. bond buying program slowing and a rate rise in December. However, remember the latest numbers out of the Fed showed that there has been no reduction in bond buying. So any reference to the progress or lack thereof in its stated schedule could be important and provide an indication of the aggressiveness with which this plan is being pursued. Bottom line: it should be an interesting week as we get some additional clarification of monetary and fiscal policy. My theses haven’t changed: (1) the more tax reform enlarges the deficit/debt, the more negative it will be for the potential increase in the long term secular growth rate of the economy and (2) the longer QE lasts, the more painful will be the unwind of asset mispricing and misallocation. My thought for the day: Most of us are twice as biased as we think we are (four times if you disagree with that statement). Physics applied to the Market. Cummins (NYSE:CMI): Q3 EPS of $2.71 beats by $0.24. Revenue of $5.3B (+26.5% Y/Y) beats by $510M. MasterCard (NYSE:MA): Q3 EPS of $1.34 beats by $0.11. Revenue of $3.4B (+18.1% Y/Y) beats by $120M. Hormel Foods (NYSE:HRL) announces that it acquired Columbus Manufacturing from Arbor Investments for $850M. Columbus is expected to help generate $300M in annual sales. The company says the strategic deal will help position it as a total deli solutions provider and enhances its other strong deli brands such as Hormel, Jennie-O, Applegate, and DiLusso. The October Dallas Fed manufacturing index was reported at 27.6 versus expectations of 21.3. Once again, no comment is required. 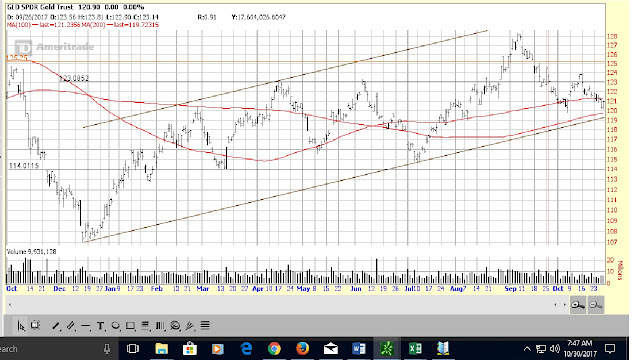 Despite a weak rally on Friday, the long Treasury finished below its 100 day moving average (now resistance), below its 200 day moving average for the second day (now support; if it remains there through the close Tuesday, it will revert to resistance), is now developing a very short term downtrend, but is still above the lower boundary of its short term trading range and the lower boundary of its long term uptrend. The dollar had another good day, ending above its 100 day moving average (now resistance; if it remains there through the close today, it will revert to support), right on the upper boundary of it short term downtrend, has begun developing a very short term uptrend but remains below its 200 day moving average. GLD managed a small recovery, but finished below its 100 day moving average for the second day (now support; if it remains there through the close on Monday, it will revert to resistance), still above its 200 day moving average (support) and the lower boundary of a short term uptrend. The VIX (9.8) got hammered on Friday---re-establishing its historic inverse correlation with stocks after four days of cognitive dissonance. It closed below the upper boundary of its short term downtrend but above the lower boundary of its long term trading range. It is back below its 100 day moving average (which just reverted to support); if it remains there through the close tomorrow, it will return to resistance), back below its 200 day moving average negating Thursday’s break and closed below the developing the lower boundary of a very short term uptrend. This suggests that it may be about to challenge the July low. Bottom line: long term, the indices remain strong viz a viz their moving averages and uptrends across all timeframes. Short term, they are above the resistance level marked by their August highs, meaning that there is no resistance between current price levels and the upper boundaries of the Averages long term uptrends. This is just a continuation of the ‘everything is awesome’ trade. Depending on how one looks at it, a weak bond and gold market along with a strong dollar could be supporting that scenario. However, when a primary rationale for buying stocks is that they are a good substitute for bonds, rising yields should be creating some cognitive dissonance. The US economic data was weighed to the positive last week as were the primary indicators. That makes last week’s call a positive: Score: in the last 106 weeks, thirty-two were positive, fifty-six negative and eighteen neutral. This is the second plus week in a row and the second week in the last four that the primary indicators have been overwhelmingly positive. As you know, I have been doubting my revised forecast of a higher economic growth based on the lack of confirming stats as well as the prospect for a further increase in the deficit/debt coming from a non-revenue neutral tax reform. It now appears that we are getting that confirming data. I should note that if there is any hesitation at the Fed about proceeding with the unwind of QE, the surprisingly ‘hot’ third quarter GDP price index should satisfy the doves that action is needed. There was only a few stats from overseas but they were mostly upbeat and they continued to confirm the pick-up in growth in the EU. As a result, I have been expecting some positive impact on our own economy; though until this week, it didn’t seem to be occurring. With the better economic numbers and the upbeat earnings reports from some of our major international industrial firms, this could now be happening. It is too soon to make that call; but at least the signs are getting hopeful. September personal income grew 0.4%, in line: personal spending was up 1.0% versus expectations of up 0.9%; the PCE price index rose 0.4%, in line. The Morning Call--What is the VIX and bonds telling us? This weekend is my annual pledge class reunion. I leave after this posting; so no Closing Bell. Back on Monday. The indices (DJIA 23400, S&P 2560) recovered some of Wednesday’s loss yesterday. Volume was down, but still high; breadth was mixed but is still very overbought. Both remain above their 100 and 200 day moving averages and are in uptrends across all time frames. The VIX (11.3) was up fractionally---now the fourth day in a row in which it has acted contrary to its historic inverse correlation with stocks. I still have no idea what that means other than major turmoil between the buyers and sellers. The index remained below the upper boundary of its short term downtrend but above the lower boundary of its long term trading range, above its 100 day moving average for the third day (reverting to support), above its 200 day moving average (if it remains there through the close next Tuesday, it will revert to support) and continues to develop a very short term uptrend. It still looks like the July low was the bottom. 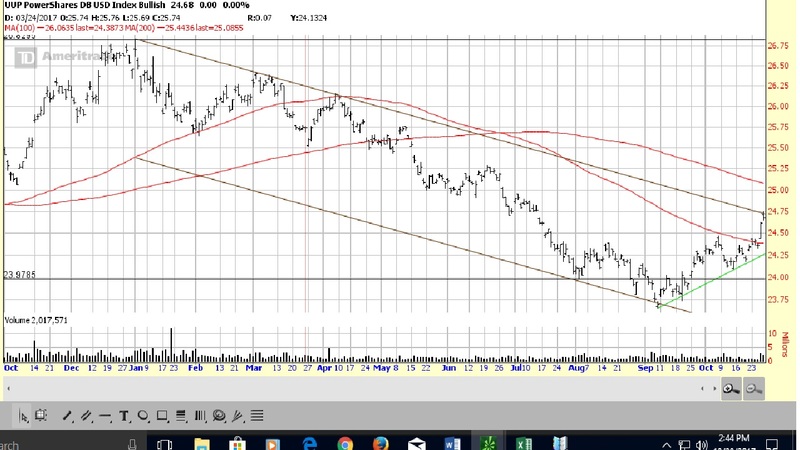 The long Treasury was down (as was the entire fixed income complex), finishing below its 100 day moving average (now resistance), below its 200 day moving average for the second day (now support; if it remains there through the close next Monday, it will revert to resistance), is now developing a very short term downtrend, is less than a point away from the lower boundary of its short term trading range but remains above the lower boundary of its long term uptrend. The dollar soared 1%, ending within in its short term downtrend and below 200 day moving average (now resistance) and back above its 100 day moving average (now resistance; if it remains there through the close on Monday, it will revert to support) and has begun developing a very short term uptrend. 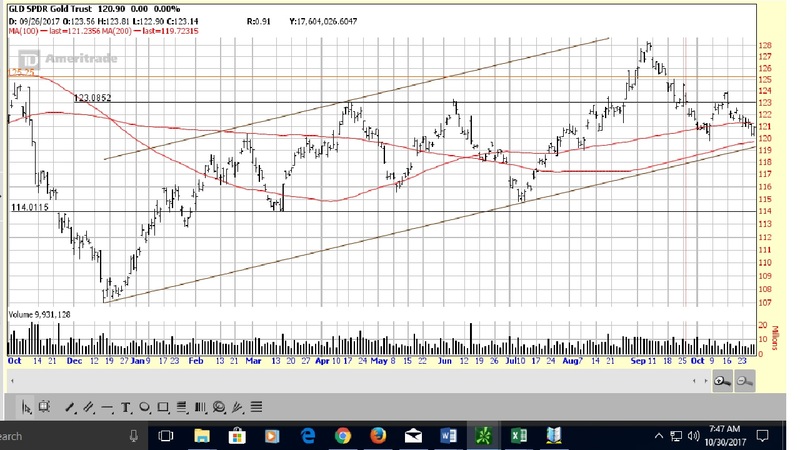 GLD fell 7/8 %, finishing below its 100 day moving average (now support; if it remains there through the close on Monday, it will revert to resistance), still above its 200 day moving average (support) and the lower boundary of a short term uptrend. Bottom line: long term, the indices remain strong viz a viz their moving averages and uptrends across all timeframes. Short term, they are above the resistance level marked by their August highs, meaning that there is no resistance between current price levels and the upper boundaries of the Averages long term uptrends. Despite some churn, this week’s pin action has still continued its upward path. The technical assumption has to be that stocks are going higher. Trading in UUP, GLD and TLT were very consistent yesterday. Despite a dovish ECB meeting, long bonds and the dollar popped, while gold got mangled---all signs of a tilt in sentiment towards higher interest rates (inflation/economic activity). I remain uncomfortable with the overall technical picture. Yesterday’s economic data was weighed to the upside: weekly jobless claims rose less than anticipated and October Kansas City Fed manufacturing index was strong; on the other hand September pending home sales were disappointing. Nothing overseas. ***overnight, September UK retail sales fell more than expected while retail employment plunged---rising retail wages are being cited as the cause of the latter. While there was little by way of data overseas, there were several developments that bear discussion. First, the ECB met; and while it announced the commencement of the unwinding of its QE program, it was dovish in tone---which is to say that it will do so cautiously and won’t commit to ending it. Nonetheless, the first step is to reduce the rate of monthly bond purchases---which gives something for both the hawks and the doves to cling to: it will still be pumping liquidity into the system (doves) but will decrease the magnitude (hawkish). I tend to side with the hawks on this issue simply because somebody else is going to have to absorb those bonds that the ECB otherwise would have. That said, it is not like the ECB is slamming on the brakes, pushing rates higher short term. As a side bar to the discussion of central bank monetary policy, remember the Fed’s stated goal was to begin reducing its bond purchases in October and to likely raise rates in December. In this article, Lance Roberts points out that as of 10/26, the Fed has done diddily. Second, the Catalans reversed themselves twice yesterday on the threat to seek independence---the latest being that a vote will taken today. Back at home, the house adopted the senate’s FY2018 budget resolution. The good news is that by eliminating the reconciliation process, it moves up the timetable for tax reform. The bad news is that (1) the budget deficit in that resolution is greater than in FY2017 and (2) the tax reform measure, in its current version, adds $1.5 trillion to the national debt over the next ten years. I will save you another diatribe on the likely negative impact of a higher national debt on economic growth. Bottom line: given the dovish tone in the ECB policy statement, Lance Roberts’ reporting on Fed activity and the house passage of the senate’s budget resolution, it is not surprising that stocks would have happy feet. What is a bit confusing is that bonds, the dollar and gold acted like higher rates are coming. Of course, equity investors could be assuming that easy money and higher rates are entirely consistent and good news (???). Whatever the rationale, I have long since given up on trying to figure out what the stock guys are thinking in this cycle. What I do take issue with is the assumption that the current budget resolution and the tax reform package, in its current form, are good economic news. To be clear, a simple, fairer tax structure is a social positive. It might even be a marginal plus for the long term secular growth rate of the economy. But, in my opinion, cost of servicing an ever higher level of debt will eat up the tax savings to the consumer and business. My thought for the day: every five to seven years, people forget that recessions occur every five to seven years. Be careful. Risk perception versus risk profile. Exxon Mobil (NYSE:XOM): Q3 EPS of $0.93 beats by $0.07. Microsoft (NASDAQ:MSFT): Q1 EPS of $0.84 beats by $0.12. Revenue of $24.54B (+11.9% Y/Y) beats by $980M. September pending home sales were unchanged versus expectations of a 0.4% increase. The October Kansas City Fed manufacturing index was reported at 23 versus its September reading of 17. The initial third quarter GDP reading was reported up 3.0% versus consensus of 2.5% and second quarter’s 3.1%; the GDP price index came in at +2.2% versus projections of +1.6% and second quarter’s +1.0%. The indices (DJIA 23329, S&P 2557) failed to sustain any follow through from Tuesday’s strong performance. Volume was down, but still high; breadth weakened but is still very overbought. Both remain above their 100 and 200 day moving averages and are in uptrends across all time frames. The VIX (11.2) was up fractionally---surprisingly modest for a big Market down day. This keeps alive a string of three days in which the VIX acts contrary to expectations. I am not sure what that means other than major turmoil between the buyers and sellers. How and when the VIX re-establishes its normal relationship should give us directional information on the Market. The index remained below the upper boundary of its short term downtrend but above the lower boundary of its long term trading range, above its 100 day moving average for the third day, (reverting to support), right on its 200 day moving average and continues to develop a very short term uptrend. It still looks like the July low was the bottom. 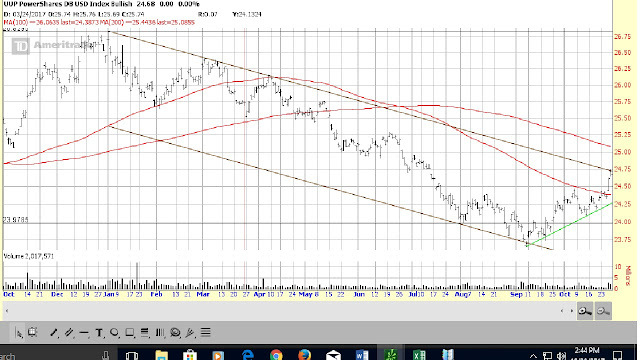 The long Treasury was down, finishing below its 100 day moving average (now resistance), below its 200 day moving average (now support; if it remains there through the close next Monday, it will revert to resistance), is now developing a very short term downtrend, is a point away from the lower boundary of its short term trading range but remains above the lower boundary of its long term uptrend. The dollar declined, ending within in its short term downtrend and below 200 day moving average (now resistance) and back below its 100 day moving average, voiding Tuesday’s break. GLD rose two cents, finishing above its 200 day moving average (support) and the lower boundary of a short term uptrend; it ended right on its 100 day moving average for a second day. Bottom line: long term, the indices remain strong viz a viz their moving averages and uptrends across all timeframes. Short term, they are above the resistance level marked by their August highs, meaning that there is no resistance between current price levels and the upper boundaries of the Averages long term uptrends. I remarked in Wednesday’s Morning Call that Tuesday’s strong pin action was ‘evidence of just how strong the underlying momentum in the Market is’. It only took one day to make a liar out of me. Once again, follow through is always a key to the investment importance of new information. However, I don’t think that negates anything with respect to the overall upward momentum in the Market. Yesterday’s performance could have been just noise. The technical assumption has to be that stocks are going higher. Trading in UUP, GLD and TLT remains inconsistent. The long Treasury’s poor price action yesterday was indicative of the performance of the entire fixed income complex and seemed to be pointing to a shift in bond investors’ outlook towards higher rates. Yet the performances of the dollar which normally rises on higher rates and of GLD which normally declines on higher rates, pointed at just the opposite. Yesterday’s economic stats were upbeat: while weekly mortgage and purchase applications were weak, September durable goods orders (primary indicator) and September housing starts (also a primary indicator) were both strong. Overseas, the third quarter UK GDP were higher than anticipated and October German business confidence was better than expected. ***overnight, the ECB (1) left rates unchanged, (2) will continue current bond buying program through year end, (3) will cut those monthly purchases in half [E60 billion to E30 billion] from January 2018 to September 2018, (4) will continue to reinvest the proceeds of the maturing bonds that it holds as long as necessary. While it was pretty much expected, early trading suggests a dovish take by investors. The main headline yesterday remained Market performance---or the lack thereof. Specifically, the failure of the indices to follow through on Tuesday excitement over corporate earnings while receiving positive economic news. (1) how significant were Tuesday’s earnings surprises? The Market’s answer appears to have been ‘damn little’. However, just as important, is the economy. That is, were they a sign that the economy’s growth rate is picking up? As you know, I have been lamenting the absence of any indication that a more business friendly regulatory environment and an improving EU economy could be positively impacting US growth. Well, those better than expected earnings combined with the strong economic numbers several weeks ago hold out hope that the US economy may be getting out of its rut, however, meager any improvement may be. To be sure, at this point, ‘hope’ is the operative word. But at least we have a couple of green shoots that could be augmented by this week’s economic data---which appears to be on the way to another strong one for the primary indicators. That said, remember I already have some pick up in the economic growth rate in our forecast; so I am not getting jiggy over this potentially better news. (2) how will the central banks factor this data [again assuming they are connected and portray an improving economy] into their models, in particular as it relates to the speed and magnitude of monetary policy changes? The bond market seems to be telling us that these better stats will add support to the central bank motivation to push forward with the unwind of QE. As you know, I hold the predicative value of bond investors’ action over that of equity investors. That said, the current move to higher rates is short enough in duration that I think it too soon to conclude the great unwind has begun. But the yellow light is flashing. My thought for the day: only invest in products and companies you can explain to a six-year old. In investing, simple is better. Make sure you understand exactly why you own a stock, bond or other investment product. That will help you know exactly why/when you want/need to sell it. Physical strength is money in the bank. T. Rowe Price (NASDAQ:TROW): Q3 EPS of $1.45 beats by $0.01. Revenue of $1.22B (+11.9% Y/Y) misses by $10M. T. Rowe Price (NASDAQ:TROW) declares $0.57/share quarterly dividend, in line with previous. W.W. Grainger (NYSE:GWW) declares $1.28/share quarterly dividend, in line with previous. United Parcel Service (NYSE:UPS): Q3 EPS of $1.45 in-line. Revenue of $15.98B (+7.0% Y/Y) beats by $360M. Praxair (NYSE:PX): Q3 EPS of $1.50 beats by $0.06. Revenue of $2.9B (+6.6% Y/Y) beats by $30M. Praxair (NYSE:PX) declares $0.7875/share quarterly dividend, in line with previous. Exxon Mobil (NYSE:XOM) declares $0.77/share quarterly dividend, in line with previous. September housing starts rose 18.8% versus expectations of down 0.8%. The September US trade deficit was $64.1 billion versus estimates of $63.9 billion. Weekly jobless claims rose 10,000 versus forecasts of up 13,000. The Morning Call--How significant are those earnings beats? The indices (DJIA 23441) exploded to the upside yesterday largely on the back of two stocks: CAT and MMM. The S&P (2569) was also up but on a much smaller order of magnitude. Volume was down, but still high; breadth improved. Both remain above their 100 and 200 day moving averages and are in uptrends across all time frames. The VIX (11.2) was up 1%---a bit of an anomaly on a very strong Market day. It remained below the upper boundary of its short term downtrend and its 200 day moving average (but it is close). 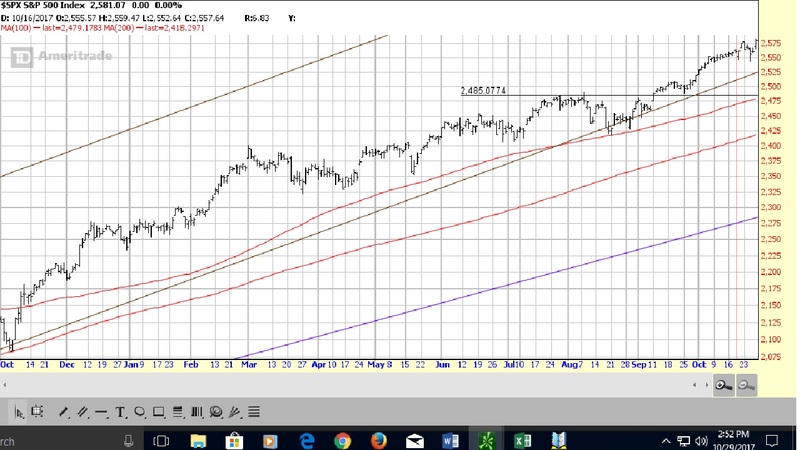 However, it is above the lower boundary of its long term trading range, above its 100 day moving average for the second day (if it remains there through the close today, it will revert to support) and continues to develop a very short term uptrend. It still looks like the July low was the bottom. 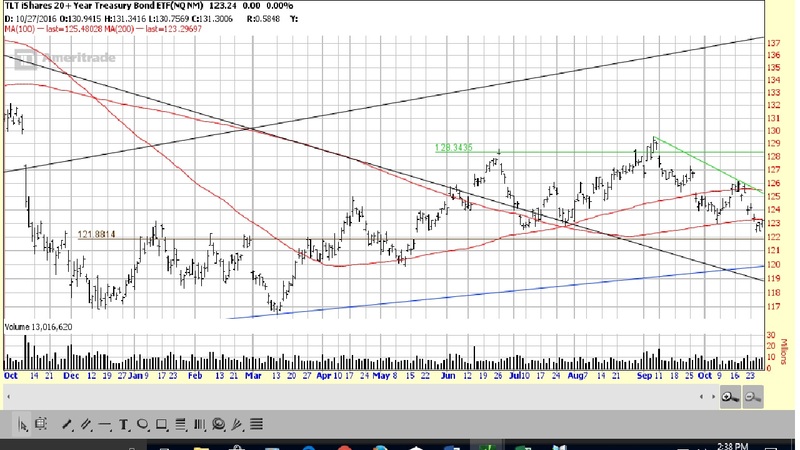 The long Treasury was down, finishing below its 100 day moving average for the third day, reverting to resistance. 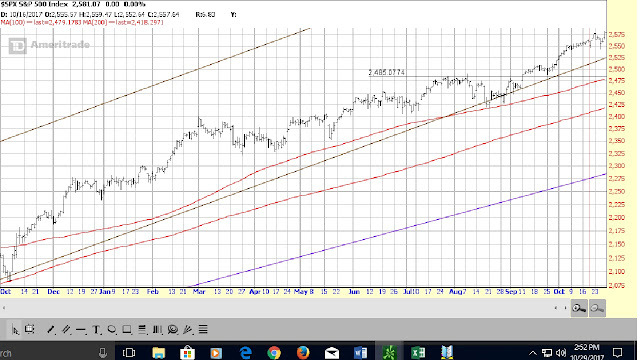 In addition, it traded right on its 200 day moving average (support) and remains above the lower boundaries of its short term trading range and its long term uptrend. The dollar rose, ending within in its short term downtrend and below 200 day moving average. However, it closed above its 100 day moving average (if it remains there through the close on Thursday, it will revert to support). GLD declined, finishing above its 200 day moving average (support) and the lower boundary of a short term uptrend. However, it ended right on its 100 day moving average. One day of consolidation (Monday) hardly deserves to be called consolidation. However, along with the big bounce in the Dow, it is evidence of just how strong the underlying momentum in the Market is. Trading in UUP, GLD and TLT remains inconsistent, although yesterday’s the pin action pointed to higher rates. Yesterday’s economic data was mixed: month to date retail chain store sales growth and the October Richmond Fed manufacturing index were below expectations while the October Markit flash manufacturing, services and composite PMI’s beat estimates. Overseas, the October Markit flash manufacturing, services and composite PMI’s were above projections. ***overnight, third quarter UK GDP growth was above forecasts as was October German business confidence. The headline of the day was the earnings beat of several industrial companies, the most significant of which were Caterpillar and 3M. These two stocks accounted for a majority of the Dow’s gain and explain why the S&P and NASDAQ trailed. I speculated in yesterday’s Morning Call that these profit beats may indicate that the US economy is much better than our forecast reflects. But on second thought, I had already raised our economic outlook based on an improved regulatory environment. So maybe these better corporate results are simply starting to reflect that. Certainly, a couple of upbeat earnings reports are not cause to raise our outlook again. I should also note that most of these companies have a major international exposure; and I have been saying for some time that the lift off in the EU economy could at some point start effecting the US economy. Again perhaps this factor along with a weaker dollar help explain the pickup in these industrial companies’ profits. To be clear, I am hypothesizing an explanation for these earnings surprises one day after they occurred. There may be other factors that present themselves that I haven’t thought of. So I could be dead wrong on all of this. The good news is that (1) our Portfolios own the stocks of every one of those reporting company. So if I am wrong, at least I am making money anyway and (2) with more information, the causes will become more obvious. Bottom line: the big question is how much significance do we give to yesterday’s earnings surprise? Whether we are seeing the results of either international or domestic economic improvement or both, it is clear that strength exists somewhere. Even though I forecast some improve in the US economy based on a more business friendly regulatory environment and suggested that the EU escaping the ‘muddle through’ scenario should be a positive for the US, there has been a lack of any results to date, save for that very upbeat week in economic data several weeks ago. Even if we assume that the aforementioned occurrences (one week of strong data and yesterday’s earnings report) are connected and reflect the economic improvement in our forecast, those positives are already in our Models. Perhaps the bigger question is, how will the central banks factor this data (again assuming they are connected and portray an improving economy) into their models, in particular as it relates to the speed and magnitude of monetary policy changes? If their answer is to push forward with the unwind of QE, then the testing of my thesis draws ever closer: a return to monetary normalization will have little impact on the economy but will trigger the unwind of asset mispricing and misallocation. My thought for the day: plan for the worst even if and as you hope for the best because we discount future risk too much, so we need to be particularly skeptical about our various estimates of results and outcomes and ought to consider more carefully the consequences if things don't turn out as well as we planned. In addition, we should value the benefits of guarantees (when available) more than the benefits of potential. Accordingly, we should typically be concerned more about the costs of failure than about opportunity costs. Canadian National Railway (NYSE:CNI): Q3 EPS of C$1.31 misses by C$0.01. Revenue of C$3.22B (+7.0% Y/Y) misses by C$60M. AT&T (NYSE:T): Q3 EPS of $0.74 misses by $0.01. Revenue of $39.67B (-3.0% Y/Y) misses by $450M. General Dynamics (NYSE:GD): Q3 EPS of $2.52 beats by $0.08. Revenue of $7.58B (-1.0% Y/Y) misses by $360M. Boeing (NYSE:BA): Q3 EPS of $2.72 beats by $0.06. Revenue of $24.3B (+1.7% Y/Y) beats by $380M. Coca-Cola (NYSE:KO): Q3 EPS of $0.50 beats by $0.01. Revenue of $9.08B (-14.6% Y/Y) beats by $240M. Month to date retail chain store sales grew slower than in the prior week. The October Richmond Fed manufacturing index came in at 12 versus expectations of 20. The October Markit flash manufacturing PMI was reported at 54.5 versus estimates of 53.3; the services PMI was 55.9 versus forecasts of 55.2; the composite PMI was 55.7 versus consensus of 54.8. Weekly mortgage applications fell 4.6% while purchase applications were down 6.0%. September durable goods orders rose 2.2% versus consensus of +1.0%; ex transportation, the number was up 0.7% versus projections of up 0.5%.